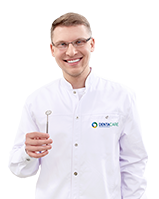 DentaCare / Advice / Endodontics – save this tooth! Endodontics – save this tooth! Do you remember those old amalgam fillings, uncomfortable dental chairs and obsolete equipment? This is the past! Dentistry is developing quickly. One of its special fields is endodontics, which enables to perform treatments using a special microscope. 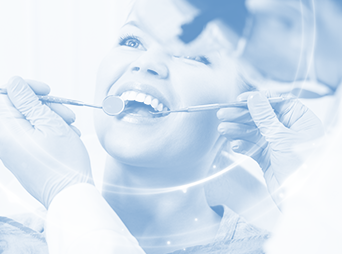 What is endodontic therapy, what are its advantages and what are its limitations? Endodontics – what is it? Endodontics (root canal treatment) is a field of dentistry that deals with the diseases of dental pulp and periodontium. When we look at a tooth, we see the part of it called the crown, made of hard tissues: enamel and dentin. However, each tooth has a hidden space inside, filled with living soft tissue which consists of – among other things – blood vessels and nerves. This tissue is called the pulp of the tooth. We distinguish between the pulp in the pulp cavity, that is the space within the crown, and the root pulp found in the canals running along the inside of the root. The periodontium sits in the gap between the root and the walls of the dental alveolus, where the tooth is connected to the bone. The periodontium protects the tooth socket and fixes the tooth in it. Endodontics literally does magic! It enables you to reach the smallest parts of the tooth. It requires great precision and accuracy. This is 21st century medicine. When do we need root canal treatment? Tooth pulp inflammation usually occurs as a result of untreated caries. Endodontic therapy is undertaken by the dentist in case of irreversible changes, where the only alternative is to remove the tooth. While this procedure is not painful, we know much more enjoyable ways of spending time. Root canal treatment can be avoided through prevention: good oral hygiene and regular check-ups in the dental office. Why cure something when we can effectively prevent it? During root canal treatment, the dentist mechanically and chemically cleanses (rinses) and widens the root canals along their entire length, and then fills the empty canals and the tooth chamber with a special formula. In this way, we treat the roots of the tooth, which serve as a framework for the reconstruction of its damaged crown. Root canal treatment saves the tooth before it is removed while also relieving dental pain. Every patient has their own configuration of the canal system. 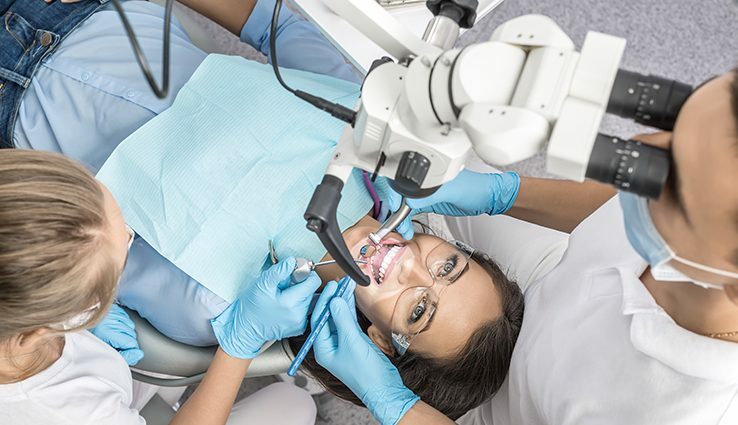 Therefore, a very precise endodontic microscope is used to perform the procedure, which enables accurate penetration of the inside of the tooth. This is an extremely complicated procedure and we can judge its success only after it has been fully completed. Root canal treatment is often inadvisable due to the inadequate clinical condition of the tooth. If the dentist diagnoses too much damage to the tooth walls, reaching deep under the gum or, for example, extensive periodontal damage around the roots, endodontic treatment may prove ineffective or even impossible to perform. Therefore, an x-ray image of the tooth is an important diagnostic tool for the dental surgeon as it is used to assess the aforementioned factors. In addition, some general diseases exclude the treatment or require some extra preparation for it, e.g. administering an antibiotic. Endodontic treatment is a delicate job. It is also time-consuming. For example, it can take a 90-minute appointment to treat a molar tooth. It requires excellent dental skills as well as expensive specialist equipment.